Whimsical and modern at once, the polka dot wall decal is huge right now. You can create any pattern from uniform to scattered, and since they peel off, there’s no pressure to get it “perfect” the first time. 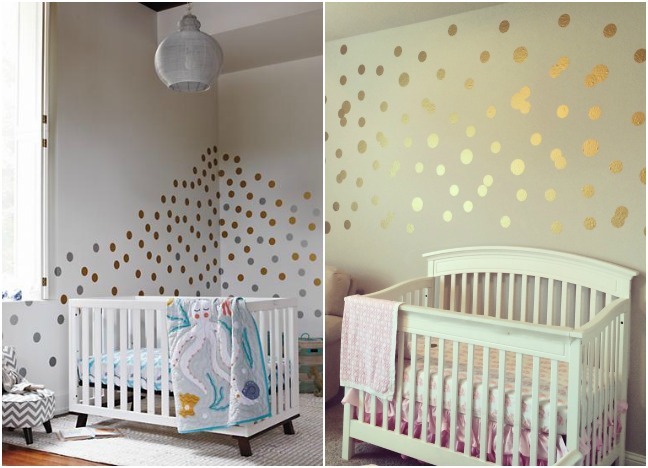 We added the ones from Land of Nod ($25 for 48 3-inch dots) to our registry (left), but ended up finding a more affordable solution at PolkaDotWallStickers.com ($16 for 48 3-inch dots). 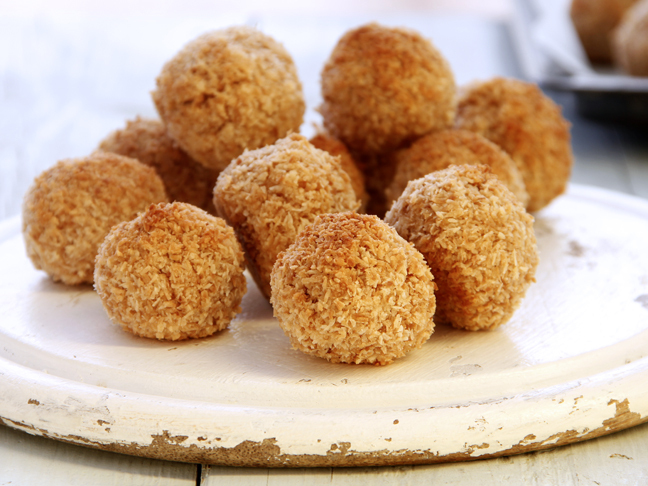 Although the pricier ones might hold up longer, we’re totally satisfied with our budget dots too. It seems you can’t go wrong either way. Seasoned moms might caution you against white or cream in a nursery, but the neutral trend is so big right now. A pop of white can add a fresh and airy feel to the space, and a pouf for resting weary feet during those late-night feedings is a great option. 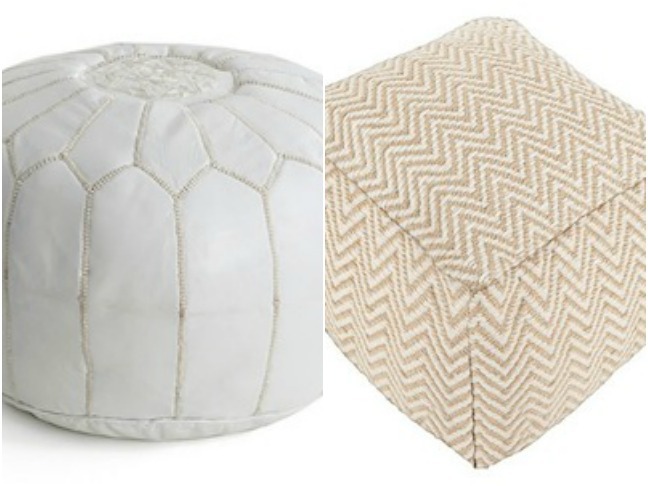 One Kings Lane has a Moroccan leather Pouf (left) for $199, a steal in its own right when compared to its original price of $375; this one features a lived-in finish that’s perfect in a nursery, and glorious embroidery on the top. But there’s no need to spend nearly $200 on a pouf when you can grab this goes-with-everything, beige chevron one from Target. Now on sale for a cool $30. Maximize the space in even a tiny nursery by creating a functional closet that looks good enough for an open-door policy. Rope bins are a multi-use option that work in any color from neutrals to bold blue or pink. Serena and Lily’s collection ranges in price from $38 to $98 each. They’re hand-woven for exceptional quality and a rustic look. 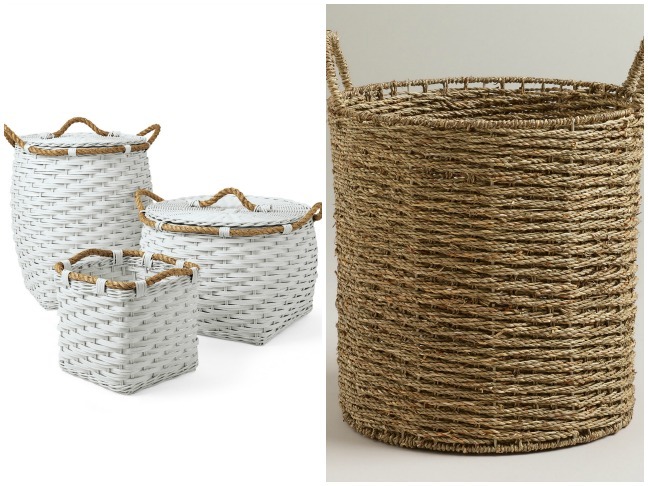 World Market offers a range of bins hand-crafted in seagrass that get rave reviews. The tote shown is currently on sale $12. Luxury items are best kept out of reach when it comes to tiny people. An elegant chandelier adds something special to the nursery. Go all-out with dripping crystals, or try a simpler version in less expensive materials. Pottery Barn Kids has options on both ends of the spectrum. The Philipa Silverleaf chandelier (left) is decked out in 57 drops and candles for a decadent vintage aesthetic. At $399, it’s a pricy pick, but couldn’t be more beautiful. 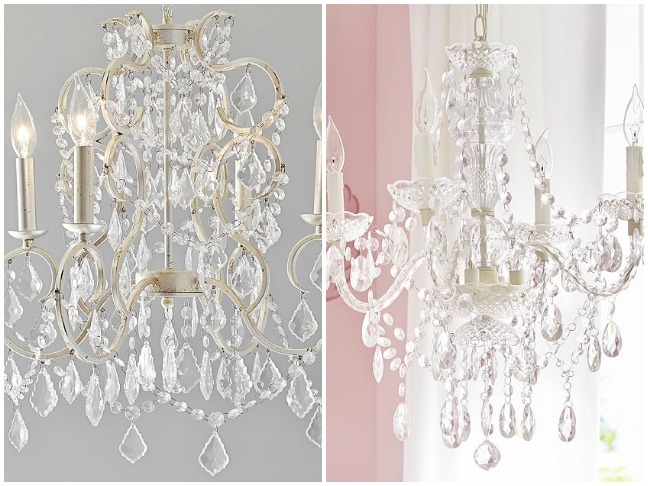 The Bella chandelier, $199, also at PBK, features acrylic beads that create a similar look to the other option at half the price.